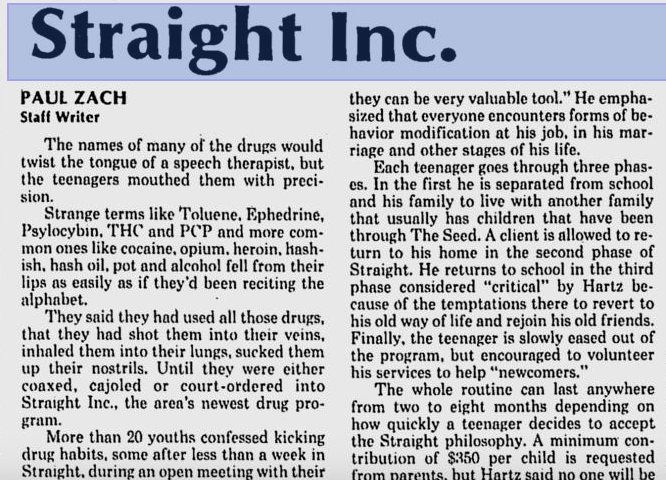 In 1981 Dupont made similar claims about Straight, Inc., a non-profit teenage rehabilitation center. 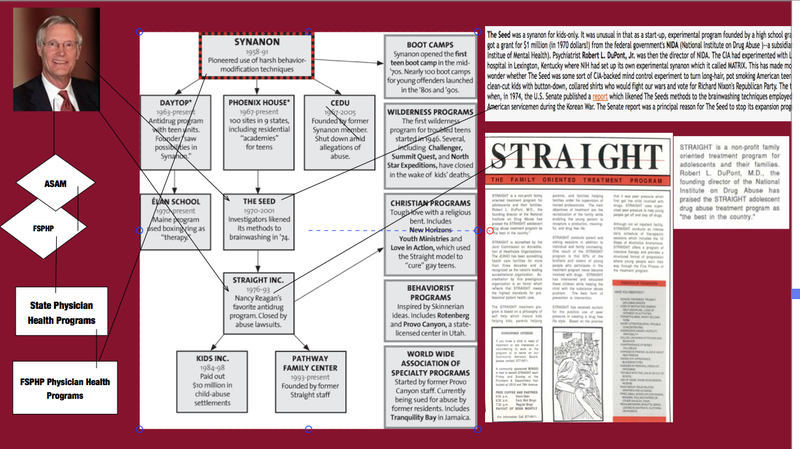 The predecessor of Straight, Inc., the Seed, was started in 1970 in Florida with a start up grant of $1 million dollars from the federal governments National Institute on Drug Abuse (NIDA). 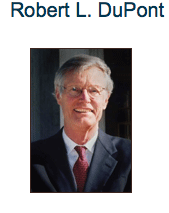 Director of NIDA, Robert L. DuPont, Jr. had approved the grant.on the antidrug cult Synanon founded in 1958. Deemed a the “family oriented treatment program,” Dupont encouraged organization and expansion. Targeting the children of wealthy white families they exploited parents fears for profit. Signs for hidden drug use such as use of Visine, altered sleep patterns, and changes in clothing style were used as indications for referral. Any child who arrived would be considered an addict in need of their services. Coercion, confrontation, command and control as the guiding principles,. Submit or face the consequences. .We know what’s right. The idea was to strip the child of all self-esteem and then build him back up again in the straight image. Abused dehumanized, delegitimized, and stigmatized-the imposition of guilt, shame, and helplessness for ego deflation and murder of the psyche to facilitate canned and condensed 12-step as a preparatory step on the path of lifelong spiritual recovery. Children were coaxed or terrorized into signing confessions, berated, and told they were in “denial. Inaccurate and false diagnoses were given to wield greater control. Reports and witness accounts now indicate that many of the kids did not even have drug problems but by creating a “moral panic” about teenage drug use they exploited parents fears for profit. Straight, Inc. became the biggest juvenile rehabilitation center in the world. 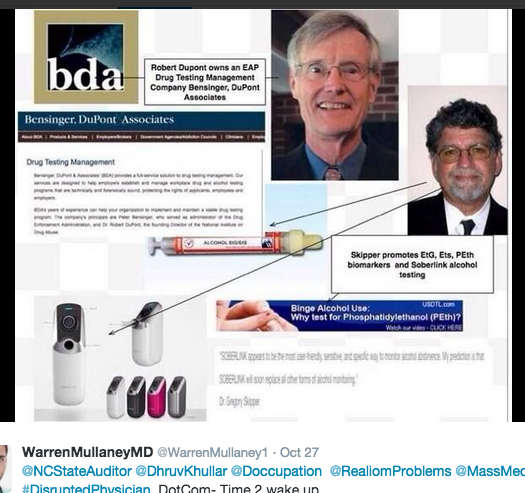 Health officials in Boston cited Straight for treating a 12 -year old girl for drug addiction when her records revealed all she did was sniff a magic marker! Pathologizing normality. Methodologically flawed research , deceptive marketing, and propaganda were all used to support the continuation of the program. Designed to be hidden from public view. Straight, Inc. had no regulation or oversight. These programs of torture and abuse resulted in many suicides, suicide attempts, post-traumatic stress disorder and other psychological and grave psychological trauma. There is a FB page dedicated in memory to all of those who died. The retrospective five year cohort study they published in 2008 is their flagship study about which they parade an 80% success rate. It is methodologically flawed in many ways with missing and incomplete information and misleading interpretation. It’s all propaganda. The 2008 Physicians Health Program study inexplicably excluded resident physicians because they “were both younger than the average practicing physician and therefore at higher risk of substance abuse.” Other than cherry picking to favor success what is the logic behind that. It would seem logical that there must have been some major precipitating event leading to the 24 physicians who left care. 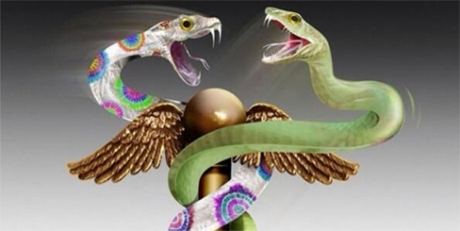 And what happened to the physicians who were removed from the programs and had their licenses revoked ?–event that could very well lead to feeling hopeless with no way out and precipitate a completed suicide. They list only 6 suicides and it appears that the outcome suicide they are using is one that was done while being actively monitored in the program. If they were removed from PHS or had their licenses revoked and subsequently committed suicide we don’t know. The outcome seems to be the last recorded clerical status of the monitored physician. Interestingly, I cannot even find any criticisms of the design of the study and its flaws–only praise and sloganeering. We need to speak up before the door closes for good.. The vast majority of people know little about Physician Health Programs. They seldom reach the threshold of public attention.